As monsoon rains continue to fall the situation in Gilgit-Baltistan deteriorates daily. Petrol, electricity and food is rationed and the area remains difficult to access. The humanitarian aid which manages to reach Gilgit is distributed unevenly and favours some villages above others. It rained very heavily all night [6 August 2010] and, at 1.40am, Wadood and I were up (trying to comfort one of the children after a nightmare) when we heard a massive ‘explosion’ and ominous rumbling for the next 10-15 seconds. I panicked, thinking that perhaps there was a landslide heading our way but thankfully nothing happened. With no sounds of alarm raised in the neighbourhood we finally went back to sleep, albeit uneasily. Early this morning a relative called to confirm that there was a massive landslide off the mountain immediately behind Jutial Mohalla – one of the largest ‘boroughs’ in Gilgit – but because there is a dense fog sitting low on the mountainside, no one is able to yet ascertain the damage. The situation is going to get increasingly more precarious unless the government or aid agencies – in one form or another – do something to ensure regular transport of basic necessities into Gilgit-Baltistan. Because the Karakoram Highway (KKH) is submerged between Attabad and Ghulmit (Gojal), there is no way to bring in provisions from China. In Ghizer District, damage was extensive; multiple portions of the road are washed out and several bridges destroyed. Babusar Pass, we are told, is partially closed due to rain-damage. My sister-in-law, Neelum, arrived for her summer vacations from Lahore two days ago. It had taken her nearly five days to make the trip between Rawalpindi and Gilgit Town due to road-blocks, washed-out highway and bridges. I’m told there are five bridges that will have to be replaced along the KKH – two are in Besham and one in Pattan. There is supposedly an alternate route available through Naran Kaghan but its reliability isn’t yet confirmed. In Gilgit, food and fuel provisions are fast disappearing. We have had two hours of electricity this morning, either from the Kargah Nala power station (which was partially damaged in the original floods last week) or Naltar to the north of Gilgit. Guru sub-station, the power house that supplies Gilgit Town’s power, was – depending on who relays the story – partially damaged or completely washed away. There are estimates that it will take at least another month or two to restore regular power to the city. Diesel supplies in Gilgit Town and the surrounding environs are finished; petrol is now running out. Because of the lack of power – on a good day we receive two to three hours, and a bad day one hour or so – many people are relying on generators. Water from the mountain channels – depending on the day and if there have been rains – is either usable for cooking and drinking (if boiled) or not at all. The water we had all last week was soupy with mud. We can no longer find milk or filtered water in the bazaars; flour and rice are running out, although there still seems to be cooking oil available. Because it may take another month for the KKH to open again – two weeks is an optimistic estimate – people are increasingly concerned they will run out of food. Ramazan may help, in a way, by reducing daily consumption rates. I’m still researching in the local hospitals and will ask them about medicine supplies; when I spoke the store master at the District Headquarter (DHQ) two days ago, they said they had sufficient supplies (although ‘sufficient’ is hardly ever enough to meet peoples’ needs). In terms of aid agencies, I’m not sure who would be the best to contact. To add, Gilgit has had its share of sectarian killings over the last two weeks; it was all sparked by a soccer match between Domyal Mohalla (Shia) and Kashrote Mohalla (Sunni) teams. 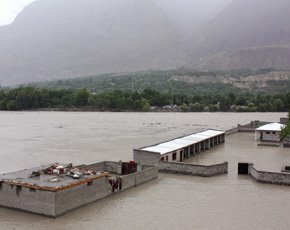 The picture was taken last week, it shows submerged homes in Sakarkui, a small village to the north-west of Gilgit Town. I suspect the best thing to do is publicise the government’s inattention to the area and its peoples.